The 'traditional' way to mount a vocal mic is to suspend it from a tall 'overhead' mic stand, and there are several advantages to this approach. First, the base of the stand is placed well away from the performer, so it won't be kicked or grabbed. Secondly, it allows space below the mic for a music stand, table, instrument, or whatever else might be appropriate to the performance. Mounting the mic from above also helps to keep it away from the line of plosive blasts that emanate from the mouth, and encourages the performer to stand up tall, opening the lungs and throat for a better performance. Finally, suspending a valve mic upside down means that air heated by the mic body rises away from the capsule, instead of rushing across it and potentially causing turbulence noise! But while it's possible to mount a mic directly on the boom arm of a tall stand, it can be difficult to angle and position it correctly, and the height of the boom arm can become a hazard for anyone moving around in the studio. The usual arrangement is to raise the boom arm safely above head height and employ a 'drop arm' to position the mic at the appropriate height from the end of the boom. 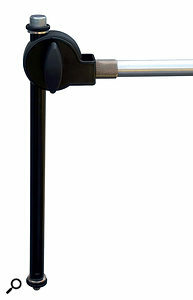 Some of the more expensive studio mic stands are supplied with suitable drop arms, but most are not. I'm indebted, then, to a long-term SOS forum member, for bringing an excellent gadget, the K&M 21431 mini boom arm, to my attention. 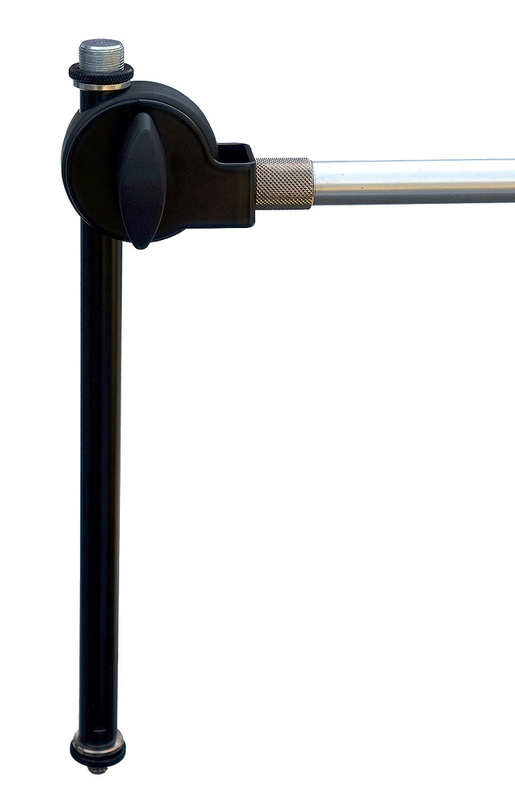 This is a 29cm, fixed-length, steel microphone boom arm, with mounting threads at both ends. The standard European 3/8-inch thread is cut at one end, and the USA's 5/8-inch at the other, and both are equipped with locking rings. The boom passes through a standard rotating clamp arrangement with a large plastic wing-nut knob to set the angle and clamp the arm in place. A steel U-bracket extending around the clamp is drilled and tapped to fit onto a 3/8-inch threaded mic stand. The total weight is a modest 0.3kg, and the result is a simple short boom that can be attached easily to any mic stand, with the length and angle of the arm being controlled by a single clamp knob. The K&M 21431 mini boom arm makes a perfect drop-arm, but it's also useful for many applications where a short boom arm fits the bill. I found it particularly useful mounted on a heavy, short table stand to place a mic inside a kick drum, for example. This simple product is an extremely useful and remarkably cost-effective accessory. Once you've used it, you'll wonder how you managed without it!